How do you navigate the music industry when you are going blind? How do you navigate the music industry when you are going blind? 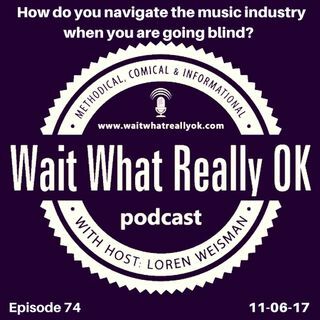 Wait What Really OK Podcast Episode 74 hosted by Branding Strategist and Keynote Speaker Loren Weisman talks with Derrick Boudwin about his music, his eyes and his thoughts on going blind. Yes, not a play on words, the guy is going blind. How do you navigate the music industry, a family, a speaking career and for that matter, the world as you are going blind? Derrick Boudwin shares his thoughts and answers in the middle of an ... Más informaciones experience that is still unfolding every day. His story mixes motivation and inspiration with the realities of what he has to face every day. For those in the middle of a journey, his words resonate as his story and journey are also unfolding at the same time. Ep 74 “How do you navigate the music industry when you are going blind?” of the Brand Management and Marketing Podcast Wait What Really OK is available on iHeartRadio. News and Information Podcast Percussion Outro by Doug Hinrichs. Podcast Blog Supplement for Episode 74 of the Wait What Really OK Podcast with Loren Weisman. Podcast Link Supplement for Episode 74 of the Wait What Really OK Podcast with Loren Weisman. It is not your fans or your customers’ job to market you. Podcast Video Supplement for Episode 74 of the Wait What Really OK Podcast with Loren Weisman. Podcast Photo Supplement for Episode 74 of the Wait What Really OK Podcast with Loren Weisman.